Happy Monday all! Is there such a thing?!?!? I'm having one of those getting nothing done kind of days! I meant to get this up this morning! Oops. My Club group met on Sunday and my downline Sharon did the demonstrating this time. She did AWESOME!!! 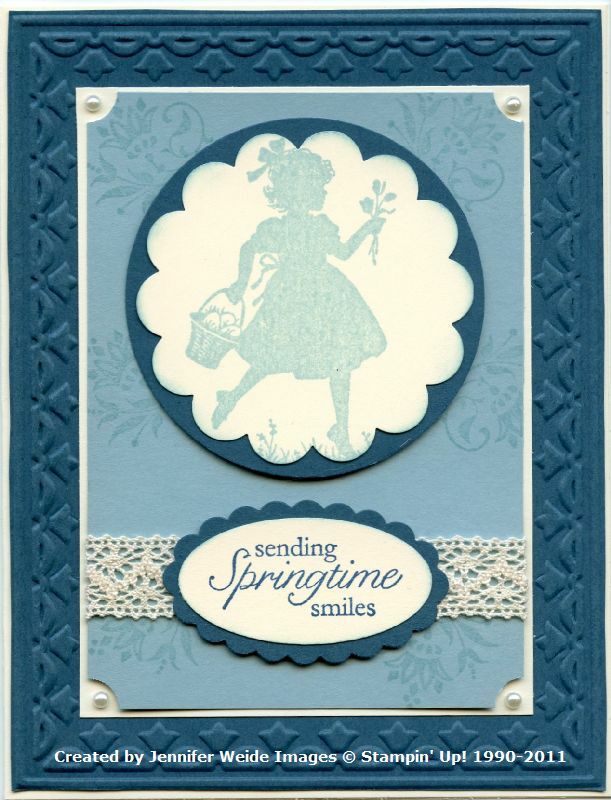 Here is her first card using the Easter Blossoms set from the Occasions Mini. Get it NOW if you don't have it!! Time is running out! 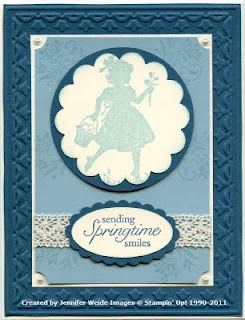 The card base is Very Vanilla with a Not Quite Navy Framed Tulip embossed layer. Inset in the frame is another Very Vanilla and then Baja Breeze. On the Baja we stamped the small floral element in Baja Breeze randomly. Under the saying is a piece of Victoria Crochet Trim attached between the layers. We punched the corners of the Baja with the Ticket Corner punch and added a medium pearl. The saying was stamped in Not Quite Navy on Very Vanilla and punched with the Large Oval. We sponged the oval with Baja Breeze and layered in onto a Scallop Oval of Not Quite Navy. The ovals are attached over the ribbon with dimensionals. The girl was stamped on Very Vanilla in Baja Breeze and punched with the 2-3/8" Scallop Circle. We sponged the edge again with Baja Breeze and layered on the 2-1/2" Circle of Not Quite Navy. She is attached with dimensionals as well. Beautiful!!! Thanks for stopping by! If you love this card, leave me a comment and I'll be forwarding them on to Sharon!! Wait until you see the others too! Check back over the next few days-there are 3 more coming! !